Measuring your website's effectiveness is how you know what is working. In this episode, Darryl takes us through the various ways you can measure whether your site is doing it's job. Darryl: Hi I'm Darryl King. I'm here with my co-host Ed Pelgen, we’re couple of old internet guys who been running our online agencies work well over 20 years. We get together weekly to talk about all things online especially for small and medium business owners or executives who still talk about their website, as they're bloody website. Each week we're going to tackle range of online issues put them in plain language so anyone can understand how to make their website work better for their business. This is episode 29. Hi Ed! How are you going? Edmund: Yep, I think; Yeah, This is an excellent topic cuz we've got 28 previous episodes telling people how to do all these different things and I thought it was a good opportunity for us to talk about; well, how the, how the heck do they measure, how do they actually know that any of this stuff that we've been telling do is having an effect and how do you actually measure if your website is doing its job and given that you're the author of the ultimate website planning guided, I figured that you would be the ideal person to have this conversation with today about measuring the effectiveness of something that you've planned for. Correct? Darryl: well, I think! In that’s potentially one of the biggest problems right? There’s a lot of people don't plan what they want their website to do? Darryl: If you, if you discount for drive in the country just anywhere it works. right? But if you're trying to drive to Sydney from Brisbane then the effectiveness is, hey are we making progress, we hit in the right direction and are we getting closer? Are we, you know and there's a lot of benchmarks and standards around; how many plumbers now it would take what an average juniors etc. Edmund: So from your experience. 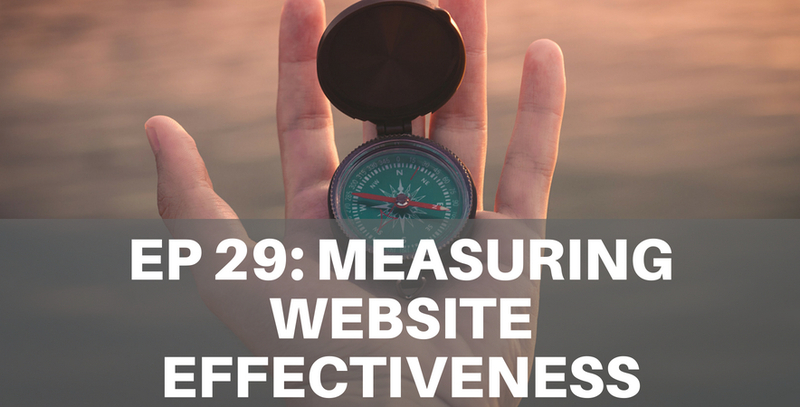 What would you say has been the way that most people measured their website effectiveness? How do they say, “What are the great; it's doing it’s a great job” what's their typical pinch mark? Darryl: that sort of things. Edmund: Yeah, So I mean, so I guess if we; if we simplified down to a very basic level. They're looking for leads or online sales and inquiries and that's at the end of the day that's all; that's all that matters ultimately. Edmund: so what you're basically saying to me is that to truly measure the effect of a website you need to have given some thought as to what the ultimate what the initial goal was that you would have built the site for and based on what you're saying it sounds like a lot of people go into the process of building a website without any clear idea of what their goals are and therefore they don't know whether it's effective because they have no idea what they're measuring against. Edmund: alright, so what I want to do now is based on what you told me I'd like you to step back a little bit right and we're assuming that the reality is that most people probably haven't planned their website effectively.Sso they really have no idea what their goals are by which they're going to measure the effectiveness of the website. So assuming assuming a lot of our listeners are in that situation I'd love you to step us through the process that the thinking and the logic of how they can start thinking about; okay; Well how do I start to measure this effective the effectiveness of my website and then maybe like you just said step into those multiple levels of effectiveness, I think that would be a really helpful process to help people start thinking about; okay, well I've got a website. Is it effective? Darryl: and sometimes that but that's the; can't see the woods for the tree moment; oh it's looks pretty, it's got some brochure information, it's got some product information that's all work but that since one way but if you were then saying; well, we only get four people to our website a month so we get three inquiries a month that's really effective it's just not the right type of effective and so then that's a different conversation so by getting those base numbers and standing exam so the first question is; What do I want? Right? And you need to know your business so if you know your business really well; you know that you're not really gonna sell a line; all right? Darryl: then you need to say; well, what do we need then we need to look enquiries to give to the sales team and that call to; do that; so that's what I've got to get how many we get or okay, now I know what I want; that's working like; How many people actually come to our lips? You know and work from those numbers. Is that kind of answer? Darryl: you know; my sites so slow it's actually that that's not making it perform so knowing that performance. If I have a warranty thing or no like the download the driver demo and people get to the site and it's so hard to get to the driver and work out which one is for me and then when I click on it; it kind of used some third-party download tool that looks very dodgy and looks like it's going to put malware and that whole thing is not engineered to be a good solution for people. So I wouldn't call that effect you know like if I; if I just want to download a free driver I'm gonna give you my license number of my; sure you did; you know; although they're not effective ways to get the results of; you have to work out all what is effective mean for that client; that means I can find it easily, I could download it quickly; install it and solve one of my problem so they like my product or I can buy the product really quickly or the information is so easy to find and there's this great call to action since; hey, just give us some basic info and ask a question. Darryl: Yeah, but the things that come to it. Like you you can you can keep a lot of online marketers really well employed with improving bounce rate; you know, it's like that's a number; right? oh, my bounce rate; I’m so upset; I've got it down to 42 percent; did that make any material difference and you know, the the key thing that we see it a lot like in Australia so I see a global traffic; you can filter it to Australia the bounce rate and it improves immediately; right? So I can whittle that doll and get the result I want out you know, the stats; anywhere which I want to present to imply. Edmund: my business goal and then everything works back from that so rather than get getting caught up with all these little metrics around analytics, around downloads and all the sort of stuff that you could; that could be distracting for you oh, I'm just trying to get this many ebook downloads because Gary Vee does or whatever it's focused on what's your business goal and then step back and logically look at your site from that perspective and just see whether all the things you're doing, all the pages, all the traffic are helping you achieve that end goal. Darryl: here's a really good example; there's a; there's a guy they taught me to and he's got a relationship with his web developer and they're trying to work and get lifted standing right? but as it stands out he's got its long-term business and they have email addresses for everyone they do work for; they're not using them they're not new not emailing they're not doing a newsletter; now; you know, it's a trade business and they do it but these people are all rich targets for them and all they have to do is not every month but what; you know; they're entering winner; it's a slow period for though; there's what's the first thing I mentioned to him was; well, you have the data; the most effective thing you can do right now is to send a newsletter with a special offer for the thing that you can now do. So you know, it's like in in winner pool guys that make pools put them in the ground they always offer a good deal because they inquire in winter no, (16:32) and one certain spring lady in the cellar. Right? so pulls them quite often; cheaper to be installed made and installed in winter because they have less on and you get them done with all there is so ideal time for them to be targeting is late summer early autumn, fall where they say; hey, want to haven't put it in winter; avoid the delays get it done and we're doing attempts in your winter special but they can boost their stuff that's really effective. it's; you know, because we're talking all things online not just websites so this person it's like you know that one email at; you've already got the email addresses they're already existing customers you've got like a thousand or so you know, you only even get five or ten jobs to; come clean the thing to do this thing and it's become effective it's not the most effective which is kind of you know turning the dials as is it the most difficult but you're not doing it now so you can get a really quick win by doing things more effectively than you work based around the primary goal which is they need to book more jobs; now getting that from the website in a highly competitive trade space is actually gonna be harder; can going back to the existing base and so like to me that's kind of like just a normal business going gets busy. they forget; I think that goes back to what you're saying you know; what I actually want here; I'd be just a bit quieter than we could be, I could do with an extra three or four jobs a week; okay, what's the easiest way to get that ? Not Oh well let's rebuild the new 18-grand website that's automatically Instagram feed; I’ve really; you know, I'd be tasting all the style check this off like; let's just; how do I get one more inquiry oh wait; what; how do I do that? What’s the fastest way I could get that? Edmund: okay, I don’t know; that was awesome especially the little dance that went; went with it. I think that's it for the day Darryl. I don't think there's any more to be said and I don't want to over complicate it. What do you reckon? Edmund: and you got that tip for free on this podcast that is amazing value and I think that's it for the day Darryl. What do you think?